The Lei Lau Kukui Award was established in 2016 to honor those who have significantly supported archival education, mentoring, and leadership in Hawaiʻi. The award recognizes the considerable efforts of individuals who foster the aspirations of those entering the archives profession in Hawaiʻi, who actively share their knowledge and expertise, and who embody the ideals set forth by the Society of American Archivists’ Core Values of Archivists. The Society of American Archivists Student Chapter at the University of Hawaiʻi at Mānoa (SAAsc-UHM) is pleased to call for nominations for its first annual award. All LIS faculty and LIS students are encouraged to submit written nominations via this nomination form. A person may submit multiple nominations. 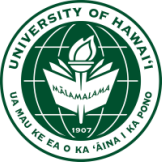 Nominations should include a brief explanation of why the candidate is worthy of such recognition, with specific reference to his/her positive impact on students at the University of Hawaiʻi at Mānoa LIS program and the archive profession in Hawaiʻi. The SAAsc Executive Board will vote on all submissions. Up to three awards may be given during an awards cycle. This year’s award will be presented at the Association of Hawaiʻi Archivists (AHA) Holiday Social. Recipients will receive an award certificate and complimentary dinner at the AHA Holiday Social. The lei lau kukui symbolizes the interwoven cooperation and sharing of information and support present in the Hawaiʻi archival community. SAAsc-UHM is incredibly grateful for mentors, educators, and leaders who have created opportunities for learning both in and out of the classroom.